It always seems to happen off the side of someone’s desk. In a meeting where a team member has indicated some level of dissatisfaction with their career progression, or compensation, or any number of other variables, their manager offers access to a coveted training program as a form of compensation. “I don’t have budget for a salary increase this year, but we could let you go to that fancy training program at Stanford. Would that work?” Training is offered as a prize and attempt to stave off the inevitable resignation, and is treated as a bonus, with zero effort to actually use or apply the content from the program (which in turn, creates greater levels of frustration, and the cycle continues). Or perhaps a team is in need of training—whether skill building or values intervention—and they’re sent off together to participate in a workshop that no one asks about again and fails to create the change they desperately need. It could also be the scheduled and systematic use of an eLearning program, designed to be exactly the same for everyone, complete with spot quizzes and compliance tracking, yet incapable of helping individuals figure out the unique elements of their job that need to change in order to remain compliant. In each of these cases, training is treated as a necessary evil, and outside of the normal work day. 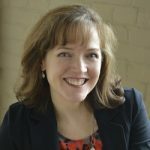 And while leaders might express an interest in wanting to understand the benefits they hope to realize, they have no expectation of measuring those benefits in any quantifiable or tangible way, or of establishing the training ROI. It’s this “throwaway” approach to training that often results in it being the first on the chopping block when money is tight. Typically, when we consider something to be an investment, we pay closer attention to it. If purchasing a home or investing in a tech startup, we establish processes that allow us to track the increasing value of our initial spend closely, looking for outcomes that validate the wisdom of our decision. The same scrutiny doesn’t seem to apply in most corporate training investments, where it’s typically treated as an expense. A necessary one for the continued sustainment of the team, but often the first place organizations look to cut when managing expenses. Training dollars are finely scrutinized, but more in terms of where to spend less. Organizations are finally starting to take a closer look at training, and instead, thinking about ways learning can be deeply integrated into their team activities, influence better organizational outcomes, and measure the training ROI. In their The Disruption of Digital Learning analysis, Bersin at Deloitte discusses the need to look at digital learning not as “learning on your phone” but about “bringing learning to where employees are.” They highlight a need for providing an adaptive learning environment, where learning is provided with the ability for teams to analyze, evaluate, and apply the content to create new solutions that are integrated along the way. Take the example of a team that is in need of more agile customer solutions. In a traditional model, teams would head “offsite” to a workshop where they’d hear about agile customer processes and technology, only to have the concepts forgotten in a few days. Instead, with a more agile and adaptive learning approach, they spend an hour or two learning and discussing concepts of agile customer care, and then decide how to apply this information within their team to serve the needs of their unique customer base. Everyone leaves the learning session with clear next steps for implementing these new solutions, ideally in a rapid way—and with tangible training ROI. A closer look at learning also includes leaders beginning to insist that their expanded investment in more impactful learning solutions also comes with the ability to track outcomes and tangible training ROI. This takes it from a “learning for learning’s sake” utopia, but instead, pursues it as a business investment with bottom-line measurable impact. How organizations can do this successfully involves several elements in advancing their thinking, solutions, and measurement of their expanded learning offerings. Organizations need to consider learning—and all of its systems, processes, and activities—as essential drivers of change and agility within their teams. This means understanding how, when, and where learning occurs, how it can drive new solutions in work, and how the benefits derived from learning can be measured. All of this requires a mindset shift in how we think about building a culture of learning in our organizations. In our Learning Culture Evolution model, we’ve taken Bloom’s Taxonomy of Learning (the aspect of the model that focuses on cognitive domains), an existing model which provides a backdrop of different levels of learning that can be provided to teams. From Remember and Understand, which focuses on recall of information, through Apply and Analyze, where learners begin to use and apply information in tasks, to Evaluate and Create, the highest levels of learning, where learners transform the information into building new models and solutions. It’s at this highest level that teams and organizations can realize the most learning and training ROI, as it is used to improve work and its outcomes. There’s a continuum across the bottom of our model that overlays this progression, as some classroom/event or eLearning training does have testing, problem solving, and possibly the ability to adapt, but rarely so. More often, these sessions are led by outside facilitators, and while they have deep levels of knowledge and expertise to help their participants understand and potentially assess and analyze the information, they rarely have the deep institutional and first-hand role knowledge needed to use the information at evaluate and create levels. Where learning starts to get more impactful is as you work your way upwards in the model. Learning needs to happen by and within teams, closer to their work, and in an ongoing, iterative process. 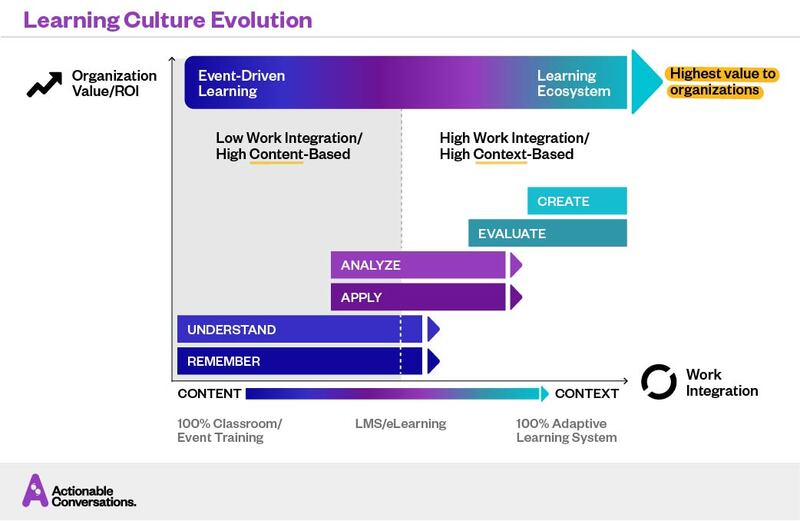 This is where learning has its highest value to the organization, and where training ROI occurs—when it’s relevant to the needs of the team, and the content can be evaluated and reshaped to solve challenges facing the team, ideally in small time increments so ongoing work isn’t stalled. We hear all the time from users of our Conversations Platform that teams appreciate having open discussions about how to improve their work that aren’t just focused on talking about it, but choosing specific action steps for making it happen. “Walk the talk” becomes something they’re able to do on a monthly basis. It also acknowledges that while sparks for new ideas can come from outside sources, the expertise for how best leverage and apply the information comes from within the team. It was from reading in Whiplash by Ito and Howe about the pace of change facing organizations today, including the realities of VUCA (volatility, uncertainty, complexity, ambiguity), that prompted the discussion internally at Actionable about the increasingly difficult job facing traditional L&D teams today. It has become almost impossible for L&D to stay ahead of the learning needs for teams: work is moving too quickly, and the timelines for developing traditional classroom and eLearning solutions are too long. Instead, L&D needs to move into the business of developing learning ecosystems, a combination of learning systems, tools, and processes that allow leaders and teams to pull in key learning at the point of need. They will still need to curate content, but with a view to allowing teams to modify it to meet their unique needs, and sharing updates on content availability as a means to inspiring the next phase of learning. This mindset shift for some L&D groups might be challenging, particularly if they’ve focused entirely on learning content, and see the infrastructure and tools of their work as a minor component. The deeper challenge (and opportunity) will be to be able to teach teams how to learn: not just to consume information, but how to test, apply, and adjust as they work to integrate new information into their activities. With a huge flood of information to absorb on an ongoing basis, L&D professionals who can help teams with building critical skills, including decision-making, sensemaking, prioritization, and focus, will help develop a competitive advantage for their organizations. There is a significant opportunity for L&D leaders to become strategic players in the leadership of their organizations, but embracing this new mindset must come first. If we are going to successfully push for greater impact and influence of learning in organizations, we need to step up in parallel with providing tangible measurements of learning success and training ROI. Compliance training isn’t going away, but seeing attendance or quiz completion as evidence of learning success misses the bigger opportunity for organizations to benefit from having it. Think about the current learning you provide or experience. What can you do to move it up to higher levels of impact for your organization? Formalizing the process for leaders and teams following every learning experience to talk about where and how they’ve implemented the learning, and the change to team outcomes, can be an excellent way to better translate learning into measurable outcomes. This scrutiny also requires being clear up front about the benefits anticipated, and how they will be measured. As organizations continue to face challenges of rapid change, forward-thinking teams and leaders will need to power their organizations with learning that is tightly integrated into the work activities of their teams, and where value is tracked and measured closely. Learning is no longer going to be a throw away, “pat on the head” answer for high potentials: it must become a key element of successful organizational capability and capacity building. The mandate is clear for those who are watching the trends and changes facing organizations today, and who are seeing the growth requirements for being competitive in a world of rapid change. The ones who figure out how to do this to a significant degree are the ones who will see the greatest level of success in the VUCA world we live in. Alyssa is Head of Content for Actionable, and is also Founder of Shift Wisdom, a change consulting firm in Toronto, Canada.